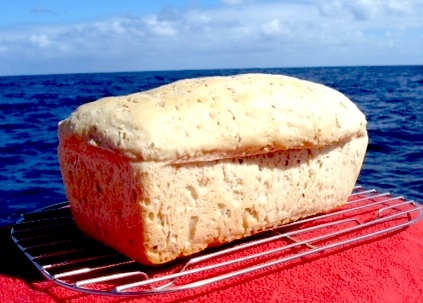 Especially for the ARC-ers, crossing the Atlantic Ocean, this bread recipe never failed me and worked with all the different kinds of flour I used around the world! Just perfect for when it’s too rocky in the galley! Preheat the oven on 220°C. Warm the water until lukewarm, add the dried yeast. Wait a few minutes and suddenly clouds of yeast will develop in the water. That is what we want. Throw all the ingredients into a food processor and mix on high speed for 10 seconds.